Acanthus mollis which is also known as the Oyster Plant as well as ‘Bears Breeches”, and the related acanthus spinosa (see picture at right) are two of the best known species available for sale in Australia. This is an evergreen perennial plant that will form a dense clump. Masses of low growing deep green glossy foliage, and tall spires of flower rising above in spring to summer. A small clump will easily cover 1m and when planted beneath deciduous trees Acanthus mollis can make a good ground cover. This plant does have its problems, mainly in that it will self seed. However deadheading can take care of that. Just remember to dispose of the seed heads. Acanthus mollis is a fairly vigorous herbaceous perennial flowering during late spring through to early summer. Large dark glossy green leaves are a feature and rthe only issue you may have is with snails eating young plants. 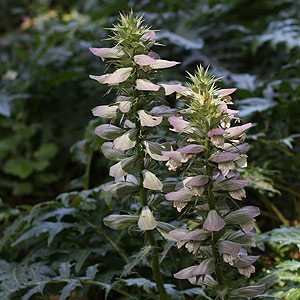 Acanthus mollis or ‘Bear’s breeches’ is an evergreen, perennial to 1 metre. Acanthus grows in an upright clump and can be good foliage plant underneath tree. White/purple flowers, well drained soil. Look for other species including, A. spinosa or ‘spiny bears breeches’ and A. caroli-alexandri, an interesting form with deep finely cut ‘spiky’ foliage, this is a great ‘texture plant’.